At the beginning of the 1960s, internal rivalry marred the efforts of the Soviet space industry to respond to the US challenge to land a man on the Moon. Irreconcilable differences over the type of propellant needed for the future "Moon rocket" divided key figures in the Russian space program. Valentin Glushko, whose design bureau held a virtual monopoly on the development of rocket engines in the country, offered the propulsion system burning toxic self-igniting propellants for the N1 Moon rocket. However, Sergei Korolev, the chief-designer of the giant vehicle, believed that the N1 should only employ highly efficient and non-toxic cryogenic propellants. As relationship between two men deteriorated, Korolev made a risky step of "enlisting" aviation engine bureau led by Nikolai Kuznetsov to provide engines for the N1. 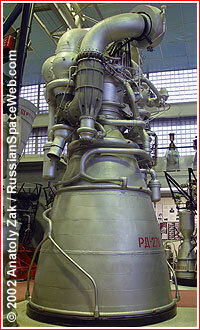 To enable the N1 rocket to carry the manned lunar expedition, Korolev had to install 30 Kuznetsov's engines with a thrust of 150 tons on the first stage of the vehicle. When critics doubted reliable performance of such a large number of engines, Glushko again proposed to replace Kuznetsov's engines with his own propulsion units capable of delivering as much as 640 tons of thrust each. Not surprisingly, Glushko's engines designated RD-270 would burn toxic propellants. An independent government commission created to evaluate the matter sided with Korolev. In response, Glushko allied with Korolev's rival, Vladimir Chelomei, proposing an alternative rocket to the N1 launcher. Designated UR-700, this monstrous vehicle would make even Korolev's giant N1 look small. Unlike Korolev's N1, the UR-700 would employ modular design of the booster stages, which would allow to test and ship individual boosters of the vehicle separately. Although Chelomei was apparently skeptical about Glushko's claims about unsolvable problems in the development of hydrogen-oxygen engines in the given time frame, he did agree to use Glushko's RD-270 engines on the UR-700 rocket. He hoped to overcome lower productivity of toxic propellants with better performance of the vehicle itself. The UR-700 would be capable of delivering a manned lander directly to the lunar surface, bypassing the need for entering lunar orbit and consequent rendezvous between the lander and "a mother-ship" -- the scheme adopted for NASA's Apollo and Korolev's N1/L3 project. In the "package" with the UR-700 rocket, Vladimir Chelomei proposed his own lunar lander known as LK-700. Not surprisingly, Chelomei's alternative lunar plans drew considerable controversy. Critics pointed out that the work on the UR-700 project would duplicate Korolev's efforts and would overload already limited resources of the Soviet Moon effort. The issue remained unsettled until 1965, when Chelomei's UR-500 rocket started flying. Around the same time, the problems Korolev had faced with N1 had become more apparent. Chelomei argued that the UR-500 had provided the first step toward the UR-700, which, in its turn could serve as a replacement for the troubled N1. (84) Along with Glushko, Chelomei managed to get support of such old Korolev's associates as Vladimir Barmin, the prime developer of launch equipment and V. Kuznetsov, the developer of flight control systems. On October 20, 1965, the minister of General Machine Building, MOM, S. A. Afanasiev gave a green light to the preliminary design of the UR-700 project. The giant rocket would use modified launch facilities of the N1 rocket, which it meant to replace. In the second half of 1966, KBOM design bureau led by Vladimir Barmin started preliminary design of the launch facilities for the UR-700 rocket. 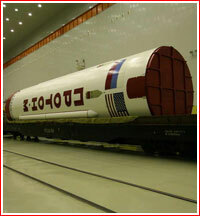 KBOM bureau considered both the possibility of adopting the launch complex for the N1 rocket for the purpose of launching the UR-700, as well as the development of an entirely new launch facility. At the end of 1966, the State Commission led by Academician M. V. Keldysh reviewed the preliminary designs completed by the contractors on the UR-700 project and recommended further research at the preliminary level. According to the latest design, the UR-700 rocket was equipped with six boosters on the first stage clustered on three axis around three boosters of the second stage. Each booster of both stages was equipped with a single RD-270 engine, which in combination with three engines of the second stage would generate 5,760 tons of thrust during the liftoff. The UR-700 would send the LK-700 lunar lander on a direct descent to the surface of the Moon. The new design of the UR-700 matched the configuration of the flame ducts of the launch complex for the N1 rocket. As result the facilities for the N1 rocket in Baikonur could now be used for the launches of both N1 and UR-700 rocket. However, the use of different propellants on the two vehicles still required to consider an entirely new launch complex for the UR-700. The final design of the launch complex developed by Department 15 at KBOM featured two launch pads separated by 1,500 meters and a command post located 5,000 meters from the pads.